Industrial Mixing Basics: What is Reynolds Number? Reynolds number is a basic principle of fluid mechanics and plays a prominent role in industrial mixing. The Reynolds number concept was first introduced over 150 years ago by George Gabriel Stokes, a mathematics professor at Cambridge. However, Stokes did not name Reynolds number. This distinction goes to Arnold Sommerfeld (strangely also not named Reynolds), a German theoretical physicist. Sommerfeld deemed the concept Reynolds number in the early 20th century because Osborne Reynolds popularized its use in the 1880s. Reynolds number is used for describing the boundary point between laminar and turbulent flow. Laminar flow is fluid flow characterized by long, smooth flow currents, mainly in the same direction as the bulk of the flow with little interaction between them. In a closed mixing system, fluids with a laminar flow have a Reynolds number less than 2,000. Turbulent flow is a fluid flow in which the velocity at a given point varies erratically in magnitude and direction (Mirriam–Webster). In a closed mixing system, fluids with a turbulent flow have a Reynolds number greater than 4,000. Mixing where Reynolds numbers are from 2,000 to 4,000 is considered in the Transitional zone. The following lab scale video demonstrates laminar flow with a high viscosity fluid (corn syrup; 2600 cps). This video shows a baffled, lab scale tank with a center mounted, axial flow, pitched blade turbine impeller. The impeller diameter and speed were adjusted for a calculated Reynolds No. of less than 10. Water was added to the corn syrup to aid in visualizing the mixing laminar flow pattern under these conditions. For comparison, the next lab scale video demonstrates turbulent mixing flow using a low viscosity fluid (water). The impeller diameter and speed were adjusted for a calculated Reynolds number > 100,000. The video shows a center-mounted ProQuip 3-blade hydrofoil in a lab scale tank with baffles. Plastic pellets have been added to aid in visualizing turbulent flow. Why is Reynolds Number Important in Industrial Mixing ? Consideration of Reynolds number is important in the design of an industrial mixer. It affects the selection of the impeller geometry, the impeller diameter vs tank diameter, and the impeller rotational speed. For example, a typical turbulent flow system would use a high efficiency axial flow hydrofoil impeller. A low Reynolds number system, however, may require anchor or double helix impellers. 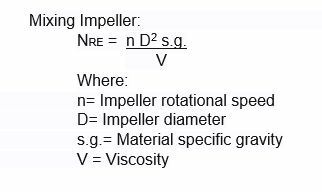 The Reynolds number calculation for a mixing impeller is based on the impeller size, rotational speed and material properties of viscosity and specific gravity. For more information, contact your Kerr Sales Representative.